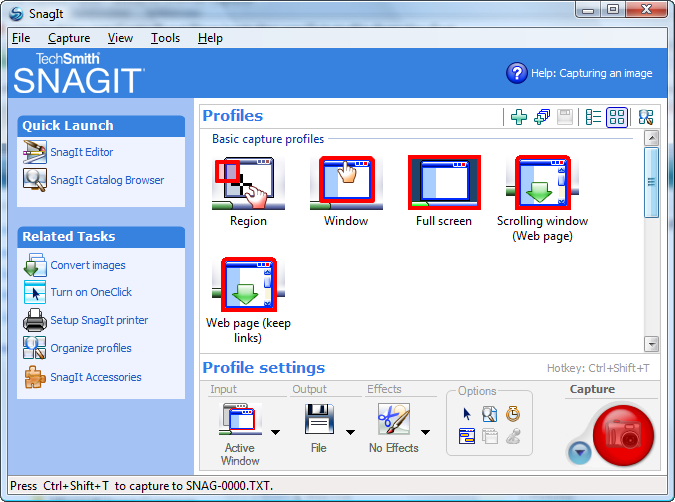 SnagIt is one of the coolest screen-capture utilities on the market today. Yes, you can use PrintScreen to copy the contents of the current screen to the clipboard, paste into Paint or another image editing application, crop, and save as your favorite image file format – all for free. Or you can save yourself a boatload of time and carpal-tunnel syndrome by shelling out $39.95 and configuring SnagIt to capture what you want, when you want, how you want, and store it where you want – all with a keystroke or two. 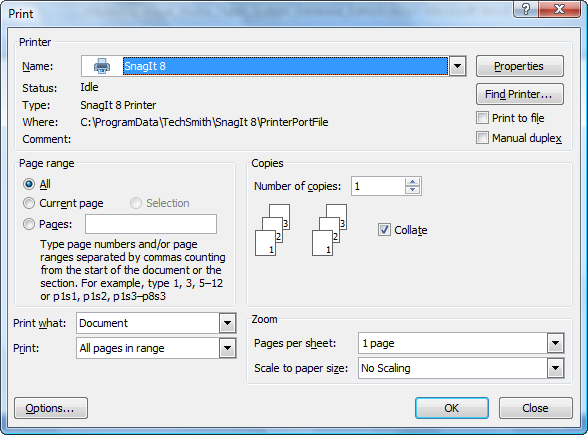 An often-overlooked feature is the SnagIt Printer. I think I use this feature more than the screen-capture (and I’m an author!). SnagIt installs the SnagIt Printer, which allows me to save the output of any program (well, any program with printing capability) to my choice of several file formats. My favorite is PDF. I use this feature a lot when submitting articles and manuscripts for review. Need a PDF but only have Word installed? Print from Word to the SnagIt Printer, click the Finish File button, choose a folder and select PDF from the dropdown – done and done. There’s a 30-day fully-functional trial available. Visual Studio Team System 2008 Team Foundation Server Power Tools Released! Microsoft announces the release of Visual Studio Team System 2008 Team Foundation Server Power Tools! 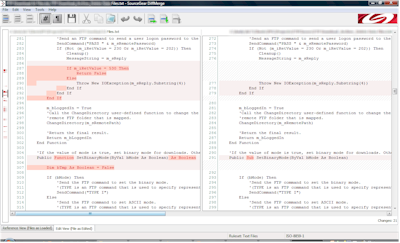 The SQL Server PSS group announces the release of RML Utilities. · Which application, database or login is consuming the most resources, and which queries are responsible for that. · Whether there were any plan changes for a batch during the time when the trace was captured and how each of those plans performed. · What queries are running slower in today’s data as compared to a previous set of data. You can also test how the system will behave with some change (different service pack or hot fix build, changing a stored procedure or function, modifying or adding indexes, and so forth) by using the provided tools to replay the trace files against another instance of SQL Server. If you capture trace during this replay you can use the tools to directly compare to the original baseline capture. CozyRoc has a suite of Control Flow Tasks that are worth a look. We’re using the SFTP (Secure FTP) and SSH Connection Manager on my current project. Once we identified the need for SFTP, I looked around and identified a couple companies / products. The CozyRoc download was the only one I could make work. I’ve communicated with the company a few times with questions about functionality. I found Ivan to be very responsive and refreshingly open. We’re planning to use other tasks in the suite as well: the Script Task Plus, Zip Task, and Database Partitions Task are slated for use. It’s all good stuff and the price is extremely reasonable ($99.95!) – especially when compared to the competition. I like SourceGear. I like what I know about the company, the people, and their products – mostly the people. 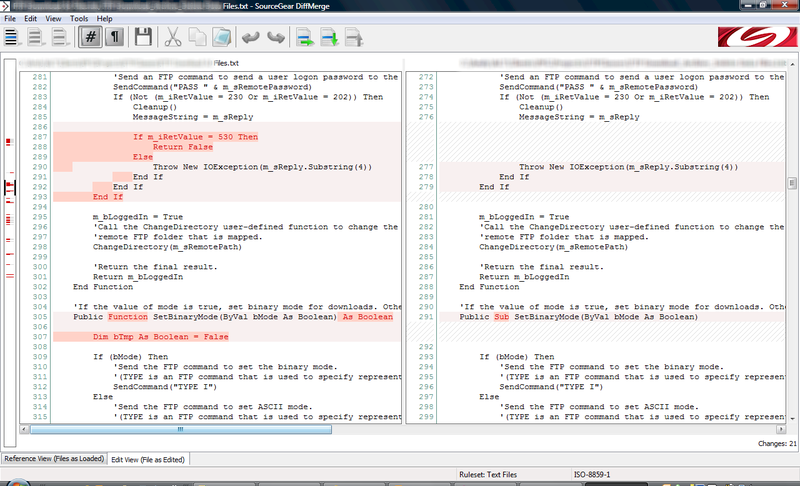 SourceGear DiffMerge is helping me this morning. I created an FTP class in an SSIS Script Task from code I found online because… well, that’s another post. At this point in my refactoring, I have implemented this class in a couple/three places. As the project has matured, subtle differences have emerged between the functionality in one implementation and others. I’m using SourceGear DiffMerge to compare the text in the classes. Simple, clean, efficient, fast. DiffMerge doesn’t automatically refactor for me. It just tells me what the differences are and where they lie in my code. It allows me many options for merging the files, but it doesn’t force them on me when I start. Maybe, just maybe, all I want to do is see the differences first. Great product, and it’s free. Ken Henderson blogs about some cool new utilities / tools for SQL Server: SQL Nexus, SQLDiag, and Retrace! This may be a little off-topic. I use Virtual Server and Virtual PC a lot for things like testing beta and CTP releases of SQL Server. I don’t have time or the inclination to reformat physical hard drives, load an OS, or even fiddle with restoring from an enterprise backup solution like Ghost. 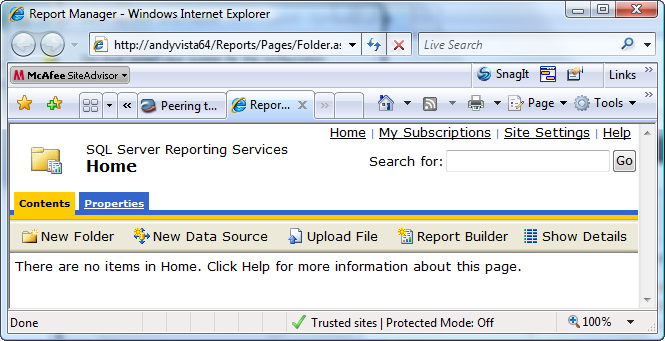 I blogged about configuring IIS7 for Reporting Services 2005, so this may have more relevance than I imagine. If you’re not using virtualized machines or servers, you should check them out. They’re great for testing new stuff – relatively risk-free. I am aware of two flavors of virtual engines: VMWare and Microsoft products: Virtual PC and Virtual Server. I have no experience with VMWare. The Microsoft products are 100% free (as in beer). I do not know which is better. I imagine that, like all things in life, one has advantages over the other and vice versa. The Microsoft stuff does what I need, so I’ve not ventured to search greener pastures (ever wonder why those pastures are greener? Think about it). Get To The Configuration Already! When I installed Virtual Server 2005 R2 SP1 on my newish Vista Ultimate 64-bit machine, I saw quirky stuff. For example, I could not change the port for admin – it defaulted to 80 and gave me an error message stating my server “didn’t allow” installations on other ports. A search ensued. I found a good article on why this was happening and how to fix it. 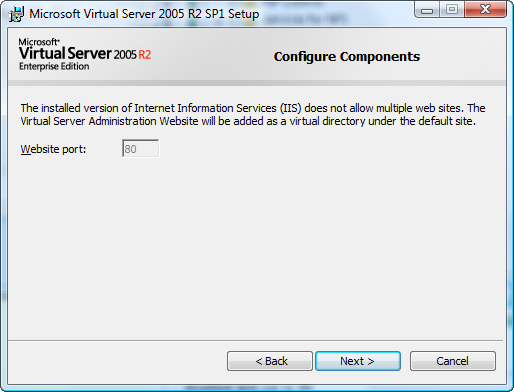 It happens because IIS7 isn’t configured (out of the box) to allow Virtual Server 2005 R2 to do its thing. To fix it, open Control Panel, Programs and Features (the snappy new Add/Remove Programs), then click “Turn Windows features on or off”. 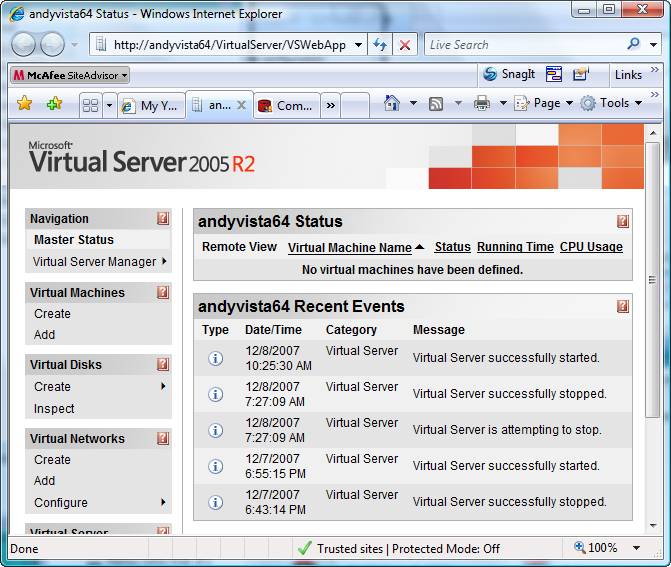 The image above may be the first on the web (it was the only one I could find) of how to configure IIS7 on Vista Ultimate 64-bit for both SSRS 2005 and Virtual Server 2005 R2. "Yes Virginia, There Is A PDC 2008"
Microsoft SQL Server 2000 SP4 mainstream support ends 8 April 2008 and – as of the datetime of this post – they are sticking with that date. That’s 4 months and 3 days from today.